See My Parent/Teacher Resource page for more information on this Special Black holiday and the very special event where I taught these crafts. for information on where to buy the wax and great lessons on candle making. Kwanza candles come in all sizes. The are made in Red, Green and Black. 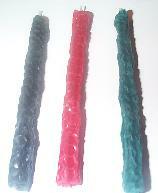 Style #1 Green, Red and Black Kwanza Candles Tapers 8"
1 right triangle sheets of wax made from 1/4 sheets. Total for one candle = 1/4 sheet. 1 Place sheet long wise. 2 Cut into two 8" squares. 5 place one wick on to the bottom edge of the triangle. Press gently. A small amount should be left over the edge. 7 Keep rolling and gently pressing VERY little at a time. 8 Gently press and roll out any air pockets. 9 Write child's name on label and place on finished candle. Make in Black, Green or Red. 1 1/16 size rectangle of wax. 4" by 2"
1 Lay each sheet down lengthwise. 2 Cut sheet in middle. 3 Cut half in half again. The Idea Box - Kwanza pages. Not Just for Kids' Kwanza sites. Pre-school activities, crafts and lessons. Huge resources! Many subjects and holidays including Kwanza. If you click on these links and order Eileen earns some free books to help her make more free lessons.